Posted in Alumni, Featured, News and tagged MFA, MFAGD, survey. Bookmark the permalink. BGSUGD believes graphic design affects our lives in profound and powerful ways. Our practical and theoretical approach fosters and promotes clarity of communication as we educate future design innovators and leaders— fearless thinkers with curious minds who share a focus on design for social impact. 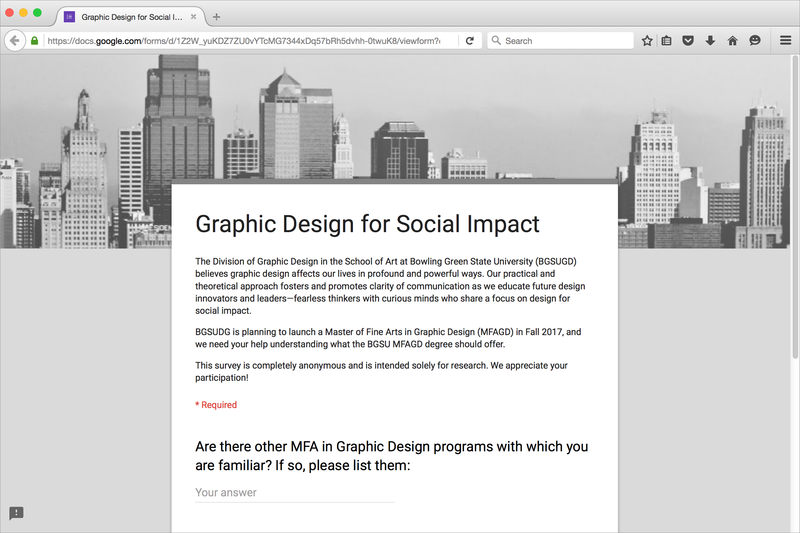 We’re on track to launch a Master of Fine Arts in Graphic Design (MFAGD), and we need your help understanding what the BGSU MFAGD degree should offer. This survey is completely anonymous and is intended solely for research. We appreciate your participation, and hope you’ll participate in this opportunity to shape the future of our program. Please click here to take the survey now!